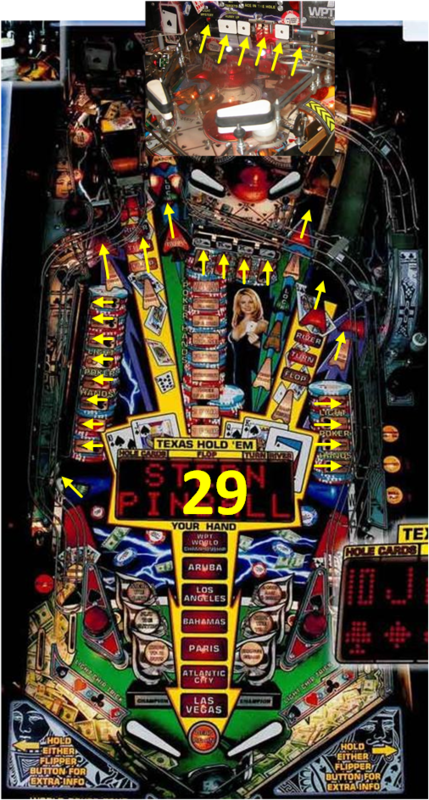 » Forum » All Pinball » Which titles have a high number of shots from a flipper? » Which titles have a high number of shots from a flipper? Which titles have a high number of shots from a flipper? 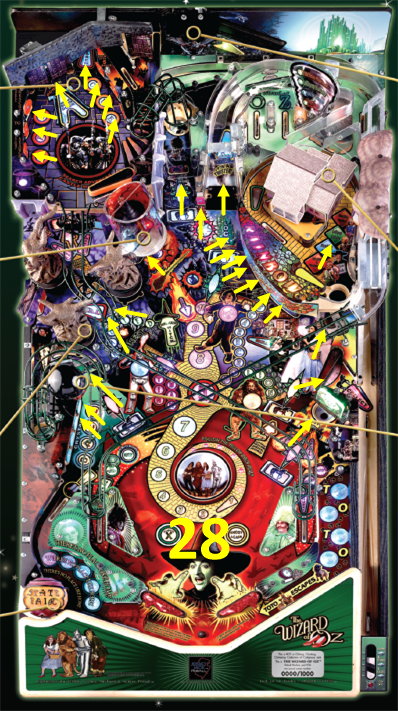 Clearly, there is more to a fun pinball machine than just a large number of shots. 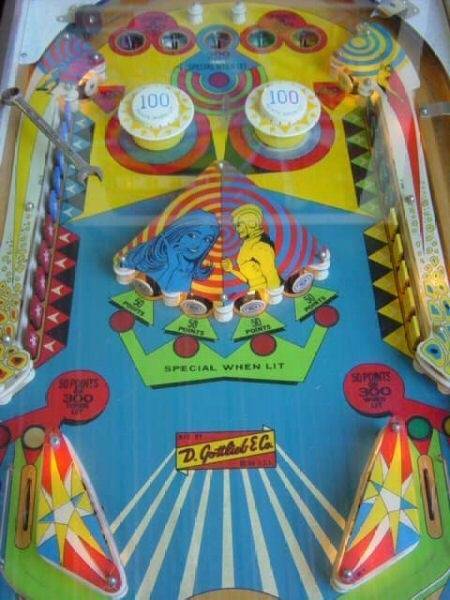 Putting that aside, what machines can you think of which have a large number of shots from a flipper? Ramp entrances, targets, loop entrances, scoops all count as long as it is a point scoring shot that can be reached directly from a flipper. 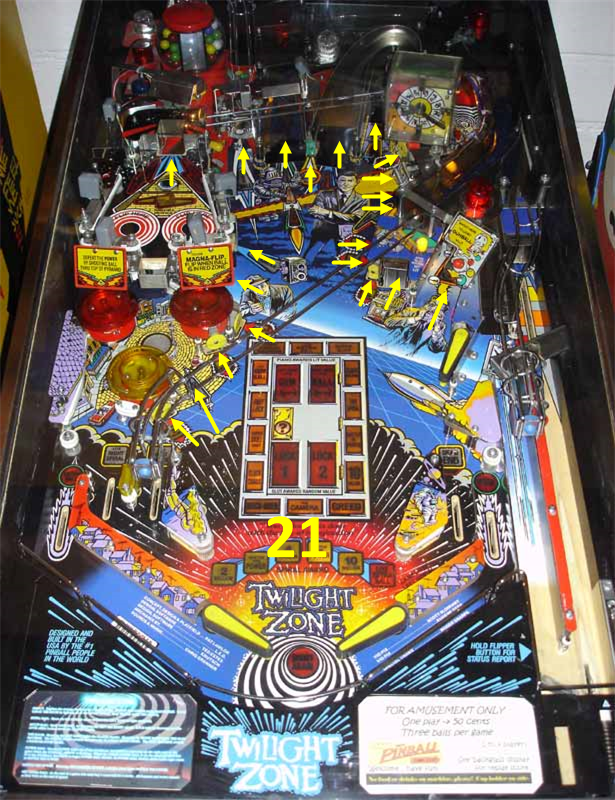 I immediately thought of Wizard of Oz (28), but was surprised that old timer Twilight Zone has a large number (21) despite its mini playfield having but a single shot. Again, this is not a judgment on fun, but just a straight accounting of things that can be aimed for. I will be interested to see any that have a lot like these two as those are my two favorite pins! Clearly I like games with a lot of crap to shoot at. Wow, somebody has a lot of time on their hands !! .. If we're going to count individual targets as "shots," Gottlieb's '2001' would have 26 shots that can be made with the flippers. Wpt has 20 drop targets plus all the other shots. I feel like counting a single target in a bank of ten for as much as a ramp is going to skew your results. Second this. I've done something similar in the past, but I won't count narrow standups at all, and target banks (standups or drops) count as 1 shot. One game having a ramp with the blue nubs at the entrance is the same to me as a ramp with 2 narrow standups at the entrance sides. For me, I was looking at something like unique or quality shots in a game. From there I look at how good they're used. I think ST is a much more fun game than Kiss because not only do I see more shots, but I think they're all used very well. What makes my head count interesting is when I come across a game like EBD, because it would have only have a couple of shots but they're used very well. From there I look at how good they're used. I think ST is a much more fun game than Kiss because not only do I see more shots, but I think they're all used very well. Agree. That's why I started the post with the comment that a high number of shots does not guarantee a fun game. Still, I thought this would be an interesting exercise. Interesting! However, I believe many of the targets are not directly reached by a flipper. Perhaps just seven (including back-handed shots) on each side plus the four directly facing the flippers would amount to 18. I'd agree on the ST vs kiss comparison, but I feel like ST loses something as, although all the shots are used in the game, there aren't many purposes to them. All the ramps and orbits basically serve a single purpose, which is just to be a mode shot. Compare that with, say, Demo Man. Only 9 shots (including the two on the left you never go for), but most of them have important things that can only be done at that single shot. One game having a ramp with the blue nubs at the entrance is the same to me as a ramp with 2 narrow standups at the entrance sides. How do you feel about games where the stand ups are actually important, like the lock targets on white water? Lexy Lightspeed - Escape From Earth has 33 targetable shots from the flippers not including stuff on the screen. 12 lane/ramp/scoop shots if you exclude standups.